Willie comes from a line of purple banners. He is sired by Spring Creek Uri a two time National Reserve Champion Fullblood Lowline Bull and CRF Willa a two tine National Champion Fullblood Heifer. 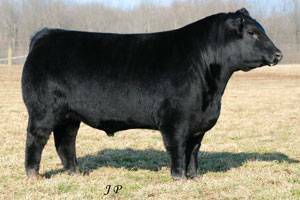 Willie has carried on the family tradition and was recently crowned the 2012 North American International Livestock Expo (NAILE) Grand Champion Fullblood Bull. 2013 NWSS Division Champion and the 2013 Ohio Beef Expo Grand Champion Fullblood Bull. Take a look, he is clean fronted, big bodied, thick, sound, great haired and easy fleshing. He is packed with great performance numbers.